How do you see Indian markets performing in 2015? 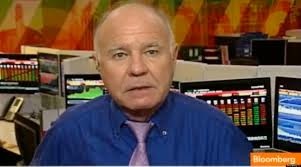 Marc Faber: At this point of time, Indian stocks are due for a correction. I think we could easily have a 10-20 per cent correction going forward. Indian markets are not about one market, they are diversified within. There are some index socks which are trading at 50-times their earnings, which are not bargain buys; while there are some companies that are reasonably valued. There have been huge expectations from the Modi government on economic reforms. What is your take on India's reform policies? Marc Faber: The problems for India are Indians themselves. The country needs a leader like Narendra Modi, but he needs to implement the reform policies. In my view that has hardly improved because of horrendous politics, bureaucracy and corruption. Reforms may rather disappoint. That's why I said that we are witnessing the beginning of a market correction. The expectations from reforms may meet with disappointment because they have been very high. I don't see foreigners meaningfully increasing their exposure to India. Do you see Indian markets getting re-rated anytime soon?